The landscaping products produced by Spray Lakes Sawmills' Top Spray division contribute significantly to the company's bottom line. An Alberta sawmiller's venture into producing--and applying--landscape materials from residual wood product is paying off, and making a solid contribution to the bottom line during a time of low lumber prices. For years, forest companies have been struggling with the challenge of what to do with the massive amount of wood waste generated as part of the wood products manufacturing process. But Alberta's Spray Lake Sawmills is one Canadian company that has a long history of capturing the full potential of this renewable resource. Biomass is the new buzzword in the Canadian forest industry, with companies looking at a variety of options, from using forest residues to generate power and heat to manufacturing ethanol. Over the past decade, Spray Lake Sawmills of Cochrane, Alberta, has invested in marketing wood residuals as both feedlot bedding and landscape products. This division of the business operates as Top Spray. It started with producing bark mulch as a way for the mill to manage its bark byproduct without having to burn or landfill it. But Top Spray has now expanded its landscaping product line and services considerably to include bark mulch, compost products, soil blends, as well as custom application. Business is booming, and according to Rob Olenick, general manager of the Top Spray division of Spay Lakes, it's making a significant contribution to the company's bottom line and is experiencing substantial growth. Spray Lake is a family-owned forestry company built around a dimension sawmill. The company has been a leader for decades in maximizing fibre recovery. Top Spray is just one of the company's income streams. In addition to softwood lumber, Spray Lake also produces wood products such as treated lumber, fencing and fence posts. The feedstock for the Top Spray operation comes from bark accumulated from the company's sawmill debarker, representing between 30,000 to 40,000 green tonnes of bark on an annual basis. However, Top Spray has grown to such an extent that the company also purchases 200 to 400 loads of bark annually from West Fraser's Sunpine operation near Sundre, Alberta, to keep up with demand, which alleviates a potential disposal problem for West Fraser as well. "People are getting very green and organic," says Olenick. "They want organic material and people love bark mulch because of the characteristics it has. Our business has grown primarily because of the service we provide and through word of mouth." landscape material, with its fleet of four blower trucks. Another major reason why the business has experienced massive growth is because the company not only produces a line of landscaping products, but it also has a fleet of four blower trucks to apply the material as needed. Being located close to Calgary has played a major role in helping Top Spray achieve sustained growth. In addition to strong demand for landscape products, Calgary and area has been challenged by a labor shortage. So landscape contractors have come to appreciate that they can not only purchase landscape products from Top Spray, but also hire them to apply the product with their fleet of blower trucks. Being so close to the Calgary market has long proven advantageous for Spray Lakes, which markets many of its products locally. Top Spray has grown to the point where the company has delivered and applied its products all the way from Fort McMurray in the north to the Alberta/US border in the south. It has also sold and applied its products in neighboring British Columbia. Their customer base is any homeowner that requires as little as eight cubic yards of landscape product right through to huge commercial sites. The Top Spray operation is located next to the sawmill site. According to Olenick, the production process starts with a fresh pile of debarker residue, otherwise known as ‘hog'. It is processed through a CBI Grizzly hog mill, where it is broken into smaller pieces, and then delivered to the Top Spray site where it sits in piles. This hog mill is designed specifically for waste wood such as stumps, logs, demolition debris, poles and ties, stringy bark, and yard waste. It features an extremely heavy duty, solid steel offset helix rotor that shears material from two directions against an anvil and grate. The rotor in the hog mill turns at half the speed of a conventional hammermill rotor, saving up to 90 per cent of maintenance costs associated with hammermills, according to CBI. Top Spray operates a year round operation, stockpiling its products in the winter. "The hog stays in these piles, depending on the season, anywhere from four to eight months," says Olenick. "The reason it stays there that long is to get rid of the moisture, to burn off some of the tannins and turpins, and to give it its rich color." Over time, the bark acquires a rich brown color. Part of the learning experience for Top Spray was how to avoid fires, as bark left piled in this way becomes "super hot". "When it gets to a certain temperature, we roll it to knock down the temperature and then we can screen it," Olenick says. After curing in the yard, the bark is fed into a CEC 6' X 16' Deck Screen. It is a portable diesel incline screen that is capable of screening log yard waste, compost, bark, top soil and other non-wood materials into products with different consistencies. The largest product Top Spray produces is its Eco-bark product. It was the flagship of Top Spray's business during its first year of operations and is produced at the 4" and better outfeed from the CEC screen. Today, the Eco-bark is mostly re-processed through a Rotochopper MC-266 mobile grinder so that Top Spray can manufacture a more valuable product from the material. In addition to having the mobile grinder work in the Top Spray operation, they also offer it for custom grinding services--yet another income stream for Spray Lake. The MC-266 mobile grinder can process pallets, slab wood, short logs, brush, green waste, compost, paper, cardboard or any industrial wood waste that will fit through an 18" high by 66" wide feed opening. Weighing in at about 42,000 lbs., the mobile grinder comes equipped with a 475 horsepower Cat C15 diesel engine and measures just over 50 feet long. There are two more product streams off the Deck Screen. The 3/8ths minus screen produces a fine bark mulch. It can be used as a building block for a variety of soil blends. Two trademarked products that Top Spray produces are NutriOM and NutriLoam. NutriOM is a 50 per cent compost and 50 per cent garden mulch blend that the company uses to top dress residential lots, commercial sites, and playing fields. It applies about 200,000 square metres of this top dressing material annually. NutriLoam is a mixture of garden mix, compost, peat moss, and sand. It is a rich soiless mix and Top Spray produces about 20,000 yards of it annually. At present, Top Spray also sells about 12,000 yards of garden mix every year to different companies who use is as a soil mimic. "We can use this garden mulch in place of peat moss," says Olenick. The final product stream coming from the Deck Screen is Foothills Premium Mulch, which Olenick describes as the flagship of the company's bark mulch. Top Spray sells about 70,000 yards of this mulch annually. A lot of the re-processed Eco-bark becomes higher valued Foothills Premium Mulch. Top Spray operates four blower trucks. Each is like a large dump truck with a walking floor. The walking floor conveys the landscape material into a star feeder, which grabs the product and drops it into an empty void where air pushes it into a hose and it is applied to the site. Grass seed can be added to the landscape product as it is being blown. Over time, Olenick says there is a possibility that there could be more competition for hog as more is directed toward energy production. "I believe that wood fibre is going to become more valuable in years to come," he says. However, he adds that there are a lot of untapped residual fibre resources still out there, just looking at construction waste alone. Furthermore, there are storage areas around Calgary where acres of used wooden pallets are stacked and looking for a home. Another development that will likely yield another new wood fibre resource is a directive by the City of Calgary that no organics will be allowed in its landfills by 2010. So Olenick wonders where all that additional wood waste fibre will end up, if not in some value-added use such as energy production. Diversifying into landscape products has been an unqualified success for Spray Lakes Sawmills. It has expanded by opening a depot in Edmonton and has plans to also open one in Red Deer. The company also does considerable business with its sawdust, shavings and post peelings, primarily to farmers as feedlot bedding. Southern Alberta is home to a large collection of intensive livestock operations. It sells about 8,000 tonnes of this material for bedding on an annual basis. It's welcome news that biofibre company TTS Inc has plans for a fibre mat plant--using waste wood fibre as a feedstock--in Drayton Valley, Alberta, as the town works to move on from the closure of an OSB plant. 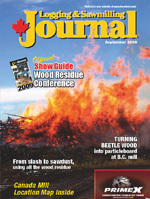 Northern Engineered Wood Products has changed gears in terms of its wood fibre diet, and is now utilizing mountain pine beetle wood--which is ground in the bush--at its particleboard manufacturing plant in B.C. Ward Weare Logging Contracting--the Canadian Woodlands Forum Atlantic Contractor of the Year--may have a simple business philosophy, but the outfit does an expert job of taking care of the details. An Alberta sawmiller's venture into producing--and applying--landscape materials from residual wood is paying off, and making a solid contribution to the bottom line. Read all about the latest equipment and technology in pellet making equipment in this issue's Tech Update feature. are gone, says Jim Stirling.